Past the halfway point on the Road to Super Bowl 53, the 2018 NFL season enters Week 10 with plenty of teams emerging as conference favorites. 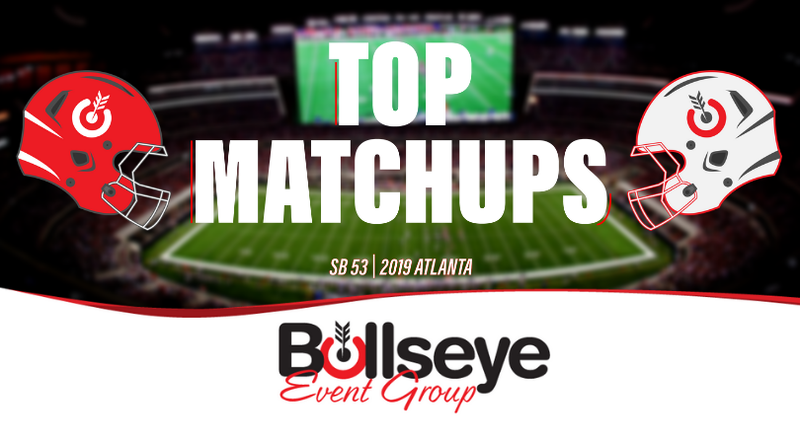 So what are some of the top matchups we could see when teams hit the field at Mercedes-Benz Stadium in Atlanta, Georgia in February 2019? One of the NFL’s elite offenses meets the best statistical defense in the league in this hypothetical matchup, as the two current-conference leaders, primed for #1 seeds and home field advantage in the playoffs, meet in Super Bowl 53. A lone last-second loss to the New England Patriots stands between the Chiefs and an undefeated record, but that doesn’t deter any excitement when it comes to this Chiefs offense. Something many didn’t see come, the Chiefs are led by an early MVP-favorite in quarterback Patrick Mahomes, who has completed 66% of his passes for 2,526 yards and a league-leading 26 touchdowns. Quarterback Jared Goff has seemingly made another leap under head coach Sean McVay, completing 68% of his passes for 2,425 yards and 17 touchdowns thus far. The feature of the Rams offense, the aforementioned Gurley, leads the league in rushing with 800 yards and 11 touchdowns through the first eight games. The Kansas City Chiefs, sitting at 8-1 and led by quarterback Patrick Mahomes, who is progressing at a record-setting pace, would meet the high-flying Los Angeles Rams, who for the second-straight season are leaving many surprised. Despite coming off a loss to the New Orleans Saints in Week 9, the Rams remain heavy favorites to represent the NFC in the Super Bowl. The classic Boston vs. Los Angeles matchup comes to the NFL. After decades of the historic rivalry of the Boston Celtics vs. the Los Angeles Lakers, and on the heels of a Boston Red Sox World Series victory over the Los Angeles Dodgers, the NFL’s version of this historic rivalry could make its way to Atlanta in 2019. After starting 1-2, the New England Patriots are on a six-game win streak, led by none other than five-time Super Bowl champion Tom Brady. As long as Brady and Belichick continue to lead the way, the Patriots will continue to be odds-on favorites to reach the Super Bowl. The offensive matchup that would create fireworks would most likely be the Kansas City Chiefs meeting the New Orleans Saints in Atlanta for Super Bowl 53. The two highest-scoring offenses in the NFL, the Chiefs (36.3) and Saints (34.9) are both scoring at lightning paces, which would make for an exciting Super Bowl matchup. Quarterback Drew Brees, in a year where he set the record for most passing yards in NFL history, has thrown for 1,990 yards and 14 touchdowns, with Pro Bowl wide receiver Michael Thomas and running back Alvin Kamara seeing the lion-share of those targets (55% of Brees’ completions). Not to be outdone, the Saints defense ranks #1 in rushing yards allowed per game, holding their opponents to an incredible 74.1 yards per game. With Brees at the helm and a solidified defensive from anchored by defensive end Cam Jordan and cornerback Marcus Lattimore, the Saints can never be counted out to make it to Super Bowl 53 in Atlanta in 2019.